(Nanowerk News) Organic solar cells are one of the most promising alternative energy technologies due to their low cost and suitability for use with flexible substrates. Progress in the commercialization of organic photovoltaics, however, has been hampered by the difficulty in finding suitable and affordable materials for the acceptor and donor parts of the cell structure. Graphene sheets have been shown to act as good acceptors when blended with conjugated polymers, but after blending, the photovoltaic characteristics of the polymers are considerably degraded. Vinay Gupta and colleagues from the National Physical Laboratory in India have now shown that the situation can be dramatically improved by blending polymers with graphene quantum dots instead of sheets ("Luminscent Graphene Quantum Dots for Organic Photovoltaic Devices"). 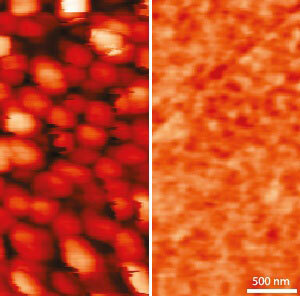 Gupta and his team prepared graphene quantum dots by hydrothermal treatment of graphene sheets. They then functionalised the dots with aniline and blended them with P3HT — a standard polymer used in organic solar cells. An interesting observation was that increasing the percentage of functionalized quantum dots quenched the P3HT photoluminescence, which the researchers attributed to efficient charge transfer from the polymer to the dots. When blended with a conjugated polymer, graphene acts as an efficient charge extractor, quickly taking the free charge generated by the photoexcitation of an electron–hole pair and conveying it to the electrode to generate an electrical current. The efficiency of charge extraction, however, is dependent on how closely the graphene and polymer are in contact. "Graphene dots perform better than graphene sheets in organic solar cells because graphene dots blend better with the conjugated polymers," says Gupta. Atomic force microscopy of the graphene sheet-based materials revealed the formation of large domains indicating large-scale phase separation. In the case of graphene quantum dots, on the other hand, the domains are very small, giving rise to a more regular morphology (see image). The photovoltaic characteristics of the resultant solar cells were dramatically improved, with a ratio of actual to theoretical power generation of 0.52 compared with 0.33 for graphene sheets. "This work could lead to cheaper and more efficient solar panels," says Gupta. "Moreover, graphene dots can also be used in this way in organic light-emitting diode displays."